The Wrap brings word that Warner Bros. is developing a Blue Beetle movie that will presumably be set in the DC Extended Universe. The studio is opting to use the Jaime Reyes version of the character, which would make it the first Latino-led superhero movie. Jaime Reyes first appeared in the pages of DC’s Infinite Crisis miniseries in 2006. 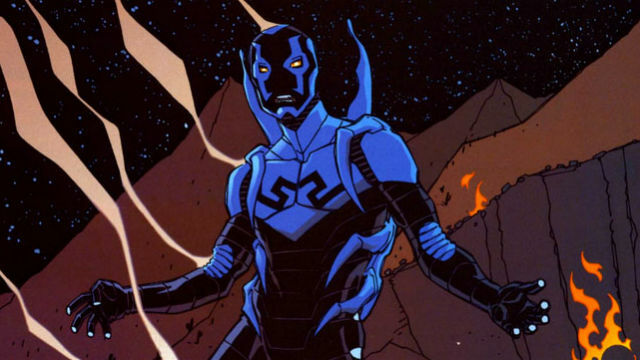 He was the third character to assume the Blue Beetle’s identity. In the comics, Jaime was a teenager living in El Paso, Texas when he unwittingly bonded with the scarab that gave him an advanced suit and a variety of tech-based powers. The scarab was also revealed to be a weapon of the Reach, an alien race and sworn enemies of the Guardians of the Universe. Jamie Reyes has also headlined his own Blue Beetle ongoing series, and he eventually became a member of the Teen Titans. The character was also featured in Young Justice and Smallville. Warner Bros. is enlisting Mexican-born screenwriter Gareth Dunnet-Alcocer to bring this Blue Beetle to the screen. Dunnet-Alcocer previously wrote the script for Antoine Fuqua’s remake of Scarface, which was supposed to begin shooting this fall. He also penned the English-language version of next year’s Miss Bala, directed by Catherine Hardwicke. What do you think about Blue Beetle joining the ranks of the DCEU? Who would you cast to play Jaime Reyes? Share your thoughts in the comment section below! Tags: Blue Beetle, dc, DC Extended Universe, warner bros.